Friday's release of the March consumer price index (CPI) highlights the risk facing the US economy as we have been discussing over the past few weeks. When the US exited the 2008 recession (using exited loosely) it was not final demand from consumers that initiated growth but rather government stimulus. Debt as is the case with most recoveries is what fuels the initial leg. Once economic growth begins the hope is that demand will accelerate and the recovery will become self-fulfilling with no need for additional government stimulus. So demand is the key to a sustainable recovery which is fueled by confidence and rising real or inflation adjusted wages. Clearly confidence is back as proven by Friday's release of March consumer confidence as it remains at multi-year highs. But the wage component is missing as the following chart clearly shows. 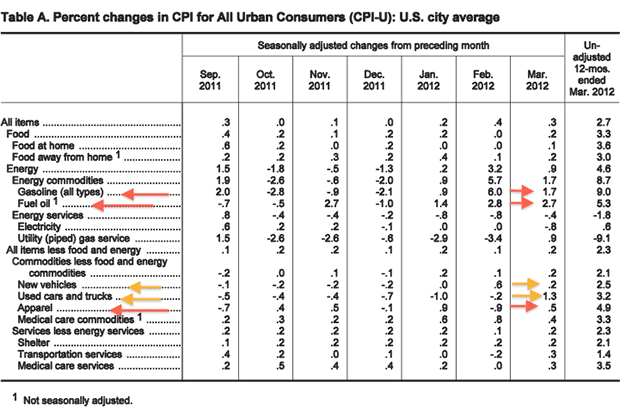 Notice how the rise in inflation as measured by CPI offsets the rise in wages. In other words there has been zero real (inflation adjusted) wage growth. So how are consumers able to buy more? 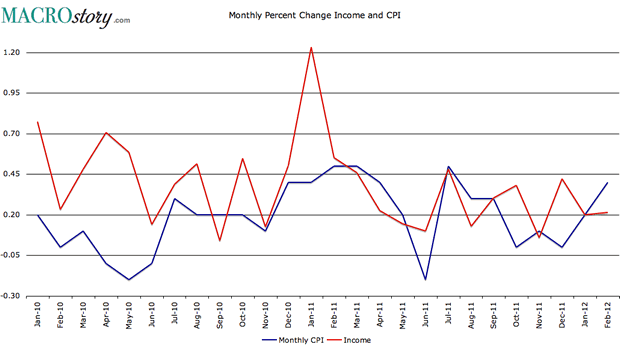 Since inflation is offsetting monthly gains in wages the only way is to spend a higher percentage of their income. 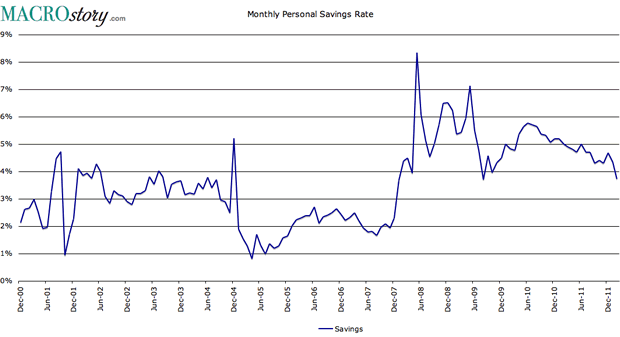 Which is in fact happening as the savings rate has been falling to mulit-year lows. The problem is history has shown this to be unsustainable for an extended period of time. So if we know that a falling savings rate is not a long term solution to increasing demand then we must focus on inflation and that is where this month's CPI report was a bit disturbing. First the numbers. Below is a chart of the monthly rise in CPI for both core (where food and energy are for some odd reason removed) and for all goods and services. 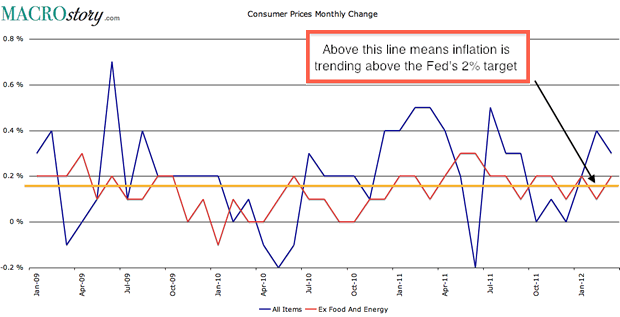 Now notice the orange horizontal line which represents the Fed's inflation target of 2%. Prices are currently above that level which means the current risk is inflation not deflation. Price inflation had been limited to non-discretionary items like groceries, gas, etc. Since we are forced to purchase these items manufacturers have greater freedom to "push through" their input costs and thus maintain margins. But in the discretionary category that was not the case. Retailers for example could not push up the price of a sofa or apparel for those purchases are "discretionary." A sofa can wait but gas in the tank or food on the table cannot. Notice how discretionary categories like apparel have gone from deflationary (contracting prices) in December through Fedbruary to now inflationary in March. I also found it interesting that used car inflation is outpacing that of new cars. So you may ask who cares if discretionary prices are rising. Well there are two concerns. First it will further pressure demand on a real basis as you will basically sell less products when inflation adjusted which in turn will pressure the labor market and the overall economy. But more important is the threat to wage inflation. If consumers are now confronted with higher prices for discretionary items they will begin to seek higher wages from their employers. Wage inflation is when inflation truly sets in and becomes a problem for one simple reason. Once you give someone a raise good luck taking it back. If wage inflation sets in then the consumer is less concerned about rising discretionary prices which will actually drive inflation higher. The result is a self driving inflationary cycle and with the Fed sitting on a massive balance sheet with huge interest rate risk this is something they will be truly powerless to combat. Even though the Chairman told the world in December 2010 inflation was not a concern as he could "adjust interest rates in fifteen minutes." To that I wish the distinguished gentleman good luck. © 2012 Copyright Tony Pallotta - Disclaimer: The above is a matter of opinion provided for general information purposes only and is not intended as investment advice. Information and analysis above are derived from sources and utilising methods believed to be reliable, but we cannot accept responsibility for any losses you may incur as a result of this analysis. Individuals should consult with their personal financial advisors.